Sunday December 31 2017, 6:00 pm. 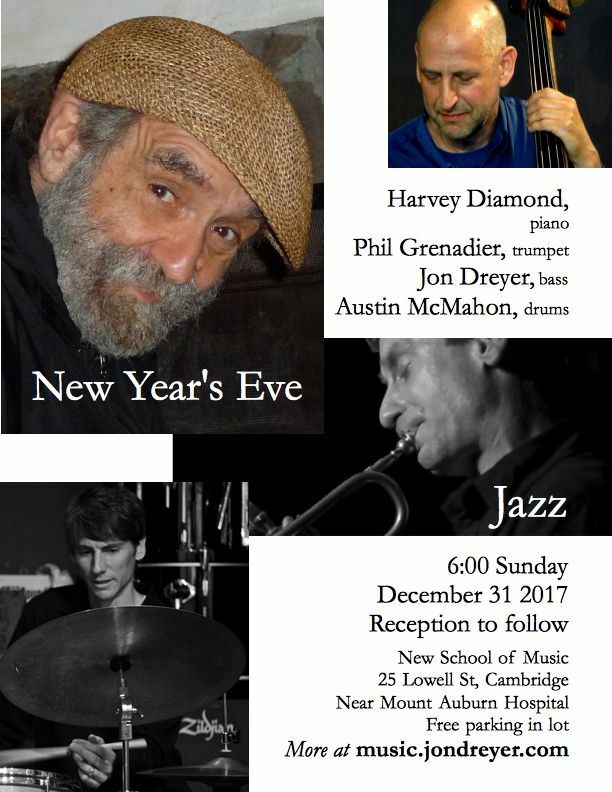 Early New Year's Eve jazz with Harvey Diamond, piano; Phil Grenadier, trumpet; Jon Dreyer, bass; Austin McMahon, drums. Reception following the performance. Come hear the concert, enjoy the reception, and still have plenty of time for more revelry. At the New School of Music, 25 Lowell St, Cambridge MA. Walk from Harvard Square, take the #71 or #73 bus, or park free in the lot behind the school. The legendary jazz pianist Harvey Diamond has graced the Boston area for decades with his music which is at once both deeply technical and deeply emotional to even the most casual listener. Critic Steve Elman of The Arts Fuse says that pianist Harvey Diamond … is almost as revered among Boston musicians as the Dalai Lama is in Tibet. Legendary bassist Cameron Brown says, Harvey Diamond is a unique and brilliant musician: a pianist's pianist with a remarkable touch, unimpeachable technique and enormous dynamic range. A creative and unpredictable improvisor, Harvey's roots go back to Lennie Tristano and Bill Evans, spiced with just a touch of Cecil Taylor. He draws the audience into his world and holds it spellbound. Harvey has done concert appearances with NEA Jazz Masters Sheila Jordan, Dave Liebman, and Art Farmer, and also with Charles Neville, Harvie S, Jay Clayton, Joe Hunt, Jason Palmer, Cameron Brown Marcus McLaurine, and many others. After decades of patience by his fans, he has finally released his first CD as a leader, The Harvey Diamond Trio . He is also a revered teacher. Bassist Jon Dreyer is one of Harvey Diamond's closest collaborators. He also performs regularly with James Merenda, both as a member of his band TickleJuice and also in more mainstream jazz settings, and has performed with most of the Boston jazz community, including Jason Palmer, Adam Janjigian, Yoko Miwa, Frank Wilkins, Joe Hunt and Steve Langone. Austin McMahon performs regularly with Jerry Bergonzi’s Quartet and has recently performed and/or recorded with Sean Jones, George Garzone, Joe Lovano, Lionel Loueke, Ben Monder, Lage Lund, Kate McGarry, Noah Preminger, Jason Palmer and Grace Kelly. He has appeared as an opening act for Grammy award-winners Dianne Reeves and Esperanza Spalding. McMahon is the winner of the 9th annual Independent Music Awards for Jazz Song Category and Nominee for Best Jazz Album in the 11th annual IMA's. His debut CD Many Muses was selected as a CDBaby Editor’s pick and described as "subtle, reverential to tradition, and thoroughly new." He was recently featured on NPR JazzSet with Dee Dee Bridgewater, WLRN Miami (NPR station) and live on WGBH radio, Boston, MA. Austin is also the co-founder, producer and recording artist for the burgeoning record label Fractamodi and has recorded on over forty commercially released albums in the past several years.